...is a wonderful creature with lots of beauty and charisma. It is a gentle, intelligent horse with an athletic body perfect for any kind of performance. The Arabian will be your best friend and competitive partner in any event - you'll just have to choose. Western, endurance riding, racing, pleasure driving, dressage, jumping, trail riding - it's all your decision! The Arabian is a very old breed. Bred by the Bedouins in the desert for more than a thousand years. Drawings and sculptures of the Oriental horse dated long before Christ have been found and also pedigrees documented in the 7th century A.D. The Arabian horse in the desert had to be a strong and trusting animal. The desert is one of earths most severe places and the animals need to develop specific characteristics to survive. The camel has its long, thick eye lashes and ability to close its nostrils to avoid the whirling sand. The Arabian horse has non of these characteristics and had to show great trust to humans. The horse not wise or brave enough to sleep inside its masters tent, usually didn't survive a desert storm. Strength, endurance and hard hoofs that didn't get worn-out by the sand or got cut by sharp stones, was also a necessity. Although when the Bedouin went out to war, he rode the long distances on his camel and had his horse by his side, ready to be mounted at sudden attacks. If the Bedouins came into the heat of the desert and his horse was about to die out of thirst, he slaughtered the camel so that his horse could drink of the water inside of the camels body to survive. "Teach your children how to ride, swim and to through a spear!" "Ride your horse... its back shall not be used as a chair!" "Don't cause your horse the humiliation to be led with a grip of his forelock!" "These lashes condemn you to the eternal fire!" An Arabian horse in freedom is often seen with a proudly raised head and with the nose in the air. The nomads says that since their horses were created by the wind they are allowed to drink it and this way gain their speed, strength and courage. 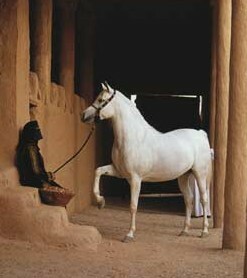 With these words I hope I made some of you curious of this fantastic breed - the Arabian. But the true feel you will only be able to find when you meet one of these "winddrinkers" and you'll eventually be as enchanted by them as I have become!